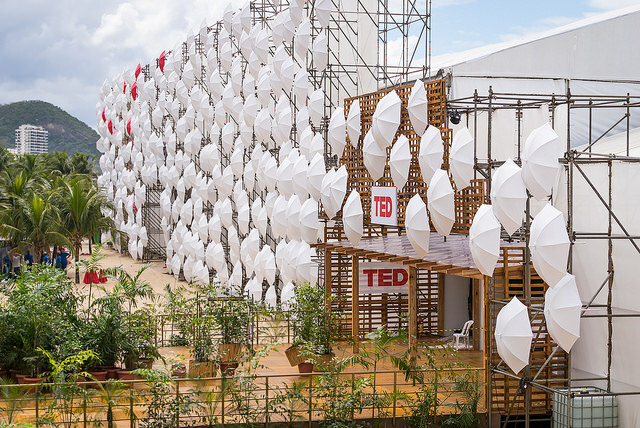 This year I was very fortunate to be sent to Rio to attend TED Global 2014. It was a dream come true, a bucket list item and something that I had always wanted to do. I was going to see over 90 amazing speakers, engage with an amazing community of people and see one of the most beautiful cities in the world. The only issue I had with attending TED Global was that I was going to have to miss my TED-Ed Club weekly meeting! It was at this point I was hit with TED-like inspiration. If I couldn’t be there for the meeting, I would bring the meeting to me. I decided that I would Skype with my group and share TED Global with them. I contacted the TED-Ed staff and asked if they could help me out. Very quickly I was contacted by Stephanie Lo, Director of Programs for Ted-Ed, and she loved the idea. When the big day arrived, I met up with Stephanie and Lisa LaBracio, one of TED-Ed animators. The students were gathered in my classroom in Pickering and the moment had arrived! I hit call on my iPad and…nothing. Again and again, the calls kept dropping. With nearly 1000 attendees at TED Global, the Wi-Fi was taxed. I was crushed and about to give up. Then I tried one last time and it was a success! For the next 15 minutes, Stephanie and Lisa took us on a tour of the theatre, the TED control room (which looks a lot like a NASA control room) and gave some behind the scenes insights. It was amazing and the students loved every minute of it. Then the internet decided that our time was up and the connection was lost. After the call, I had the students text us a few questions and I sat down with Lisa and recorded our conversation for the students. For the next 20 minutes Lisa answered each of the student’s questions and gave them insight into TED, TED Global and animating TED-Ed lessons. When it was all done I had a wonderful interview to bring back and share with the students. And Lisa’s wasn’t the only interview I was able to bring back. I also met and interviewed 3 speakers (Andres Ruzo, Melissa Flemming and Anastasia Taylor-Lind) about their TED experience and how they prepared their talks. These 3 speakers were wonderful to talk to and what they shared with the students was as inspiring as their talks on the TED stage. At the next week’s meeting, the students were excited to hear about my adventures. They really enjoyed my interview with Lisa and they ate up the speakers’ interviews. They were able to take all they learned and apply it to their talks. I saw the level of their talks increase and it inspired them to go to that next level. I cannot wait to see their finished product at the end of the semester.